So, this was the year of cooking courses: I got a pack of two for my birthday plus Christmas, and I picked two things which I’ve always wanted to get some hands-on instruction on. The first was pizza making, and the second was dim sum. The H was the one who pointed out the pizza making course to me: it’s a group thing organised by l’Atelier des Sens, which has a range of cooking courses that go from making your own bread to detailed, week-long courses for people who want to become chefs or simply terrific home cooks. The course itself was near Les Halles, which is handily located in the centre of Paris, in a large, kitchen with a huge work counter (fortunately, because 12 of us mixing pizza dough at the same time got a bit chaotic). 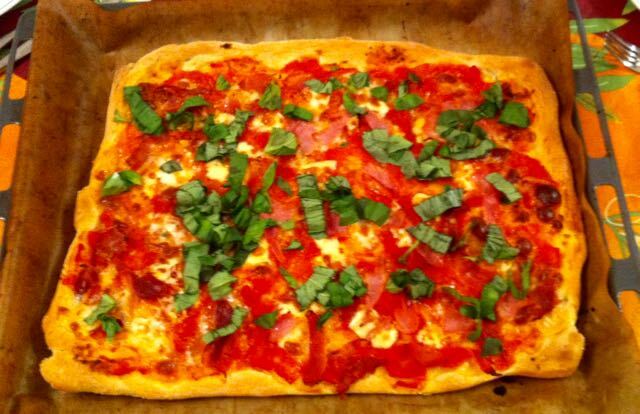 We covered pizza dough (flour, yeast, kneading), and pizza toppings, and made different combinations that we ended up eating afterwards. Yum. 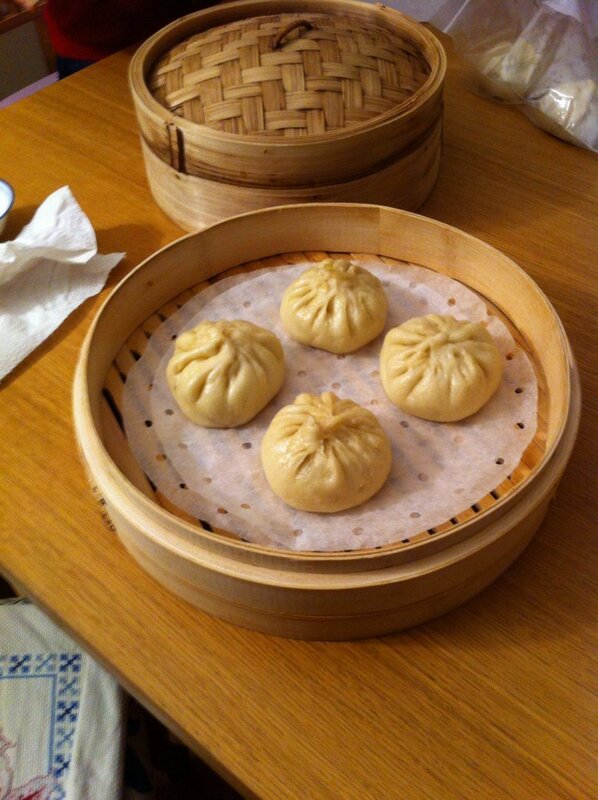 It’s, of course, hopeless to hope to cover the full range of dim sum making in a single 3-hour course, so I went with Margot Zhang’s course on making bao (buns which came down to Vietnam in a slightly different, fluffier version, bánh bao). She does group courses (4 people at a time), but alas, I couldn’t make it to one and ended up on a one-on-one course. Margot is awesome and very knowledgeable, and covered everything from making the dough to folding the pleats neatly. My first attempts were disasters. The picture you see above is my second batch, by which point she’d showed me an alternative way to fold the dough (on the counter as opposed to freeform in the air, and with a slight change of guiding hands). The resulting dough is… interesting: bánh bao is made, insofar as I can tell, from a different flour (Hong Kong flour, which is very white) and possibly includes a bit of rice flour and some milk, so I was expecting something a little more fluffy than I actually got. But they tasted divine (the H confirms ^-^). The cooking classes are both, as you can guess, very different beasts. I liked the Ateliers des Sens one a lot–very clearly pro and a smoothly oiled machine, my only comment is that there were 12 of us in the room which was a little too many I think? In a “really big group” thing like this I feel like you don’t really get a chance to handle everything. But the chef’s great and always really helpful, and it’s really geared towards making do with what you have in your kitchen without building a stone oven (which, let’s face it, not many of us will do). The Margot Zhang course is a one-on-one, and as such it’s a very different beast: I got to do everything, and to see where I was failing–my pleating technique, for instance, improved markedly when I had to pleat 15 baos in a row! You naturally get more instructor time in a situation like this. And it ended up aimed specifically at me: namely, some cooking experience, some experience handling bread/wheat dough, and a reasonable familiarity with the ingredients we were using (sesame oil and rice wine). The price range, of course, isn’t the same, though due to Margot’s prices being more than reasonable, both this and the pizza making class ended up in the same hourly rate ballpark (it was 75 euros for 3 hours, and I ended up bringing 10 big buns of pork-filled goodness home in addition to the recipe).